Tunisia's secularist women are mobilising to defend their western lifestyle after the Islamist Ennahda party swept the country's first free election and claimed almost all the seats won by women in the new assembly. Groups of women are now lobbying the political parties to protect a pioneering 1956 law granting them full equality with men and to counter growing pressure from radical Muslims keen to push them back into traditional roles. University lecturers in Tunis, women and men, staged a short strike on Thursday to protest against radicals who -- encouraged by Ennahda's strong showing in the Oct. 23 poll -- have been harassing women teachers to dress more modestly. 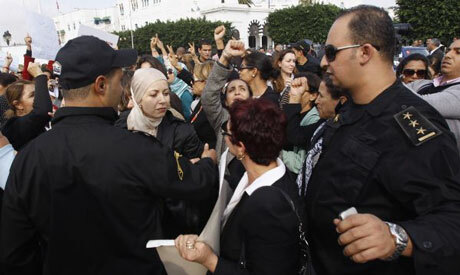 About 500 women responded to calls on Facebook to protest in the capital's government quarter on Wednesday and were granted a short meeting with interim Prime Minister Beji Caid Essebsi to present their demands. "We're here to denounce all forms of extremism and bans on women's liberties," said one of the protesters, Madiha Bel Haj. "We want a constitution that respects women's rights and doesn't roll back the advances we've made." The protests look set to continue even though the main parties, including Ennahda, have pledged to maintain the rights that have made Tunisia's women among the freest in the Arab world. Many secularist women, including urban professionals, say they do not believe these promises. The core of their demands is an iron-clad defence of the Personal Status Code, a series of progressive laws brought in by independent Tunisia's first president, Habib Bourguiba. The Code banned polygamy and gave women equal rights in marriage and divorce. It was extended over the years to include a detailed list assuring women equal say in decisions about bringing up their children, once the prerogative of men. "I've come to support the idea that the Personal Status Code and other women's rights should be written into the new constitution," said Mounira, another protester at Wednesday's rally in the government quarter. Ennahda and the other main parties in the new assembly say they will strengthen the defence of human rights in the new constitution they are due to write over the coming year. Samir Ben Amor, a leader in the second-placed Congress for the Republic party, said the assembly would probably include international human rights conventions in the constitution. While there was a broad consensus among the parties to defend the Code, he said, no country would write such detailed legislation into its constitution. "They shouldn't escalate demands like that," he said of the protesters. The new assembly will be 22.6 per cent female -- on par with the average level in Europe. But some secularist women say they are alarmed that most of the female members are Islamists. Of the 49 women elected to the 217-seat assembly, 42 belong to Ennahda, the only party that closely followed the official election guidelines calling for parity on party lists. Rachid Ghannouchi, the moderate Islamist who founded Ennahda in 1989, boasted that his party's 90-member faction was almost equally balanced between men and women. "The principle of equality is more equally applied in Ennahda than in the secular parties," he told Reuters. "These women will fight for their rights. The secularist women won't monopolise the definition of women's rights." The Islamic headscarf, which was banned from schools and public offices under former President Zine al-Abidine Ben Ali, has become a symbol of the different approaches the two sides take towards laws in the new system. The ban on the headscarf has been dropped since the January revolution that swept Ben Ali from power. Secularist women want official guarantees they can't be forced to wear it, while Islamists want assurances they can wear it wherever they want. The secularists have lost the elections. They have no right to impose their minority views on the majority. The majority of Tunisians want Islam, not the permissive laws of Paris. These women must learn the rules of democracy first before taking to the streets to vent their indignation at the result of the elections.